By Jessica Nunemaker Subscribe for free to my RSS feed. Thanks for stopping by! 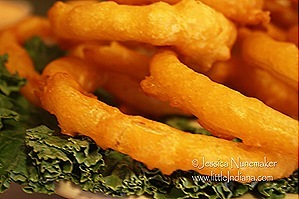 Onion rings at Roberts’ Southfork Restaurant and Pub in Mulberry, Indiana. Oh, Roberts’ Southfork Restaurant and Pub in Mulberry, Indiana how greatly we underestimated you! We’ve already covered that this is just a teeny tiny Indiana town. So imagine our surprise at eating one of the most fabulous meals ever! If you’ve been exploring little Indiana at all, you have probably quickly learned that, just as you can’t judge a book by its cover, you also can’t judge a mom and pop restaurant by its location! When we walked in, well, we had no idea we were heading into finger lickin’ good territory! 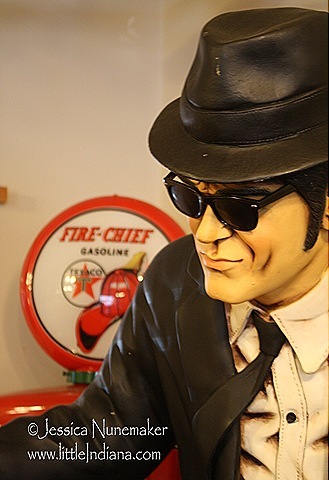 There was a fish tank in the wall over a table (a great table to entertain baby), life-sized Blues Brothers statues, and plenty of seating. Now, on to the important part! Roberts’ Southfork Restaurant and Pub has quite a menu! Town history, restaurant history, even area history–this menu had it all. Plus a few games for the kids, and, of course, a great selection of food. There was a very sizable fish selection that you don’t normally find in a small town. At this point I was so hungry (and slightly car sick) that I asked our server for a recommendation on, um, everything! 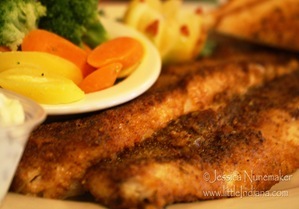 She said that people love the blackened walleye and the whole catfish. We really wanted some kind of appetizer and she suggested onion rings. Huh? I grudgingly ordered onion rings. It’s not exactly something that I ever really get a taste for but I’ve learned to trust the judgment of the servers. Now, it must “officially” be said–the onion rings at Robert’s Southfork Restaurant and Pub are absolutely the best onion rings I have ever had! I am pretty sure that I ate more than half of that big old platter of onion rings. Hubs very kindly let me have the last one, too. They were so good I am still getting cravings for them! Bring on the walleye! Yes, this was good, too! Hubs’ catfish was really good. Well, of course I had to taste it! It turns out that you can get really good fish in little Indiana, even in a town as small as Mulberry, Indiana. There was plenty of food. So much so that I brought home a container. I just couldn’t finish it–or maybe it had to do with all those onion rings! Either way, Roberts’ Southfork Restaurant and Pub is definitely a place you should mark down and make a point to visit. Those onion rings are something else!